1. What cohesive devices are. 2. How they are marked in the exam. 3. Examples of cohesive devices. 4. Faulty use of cohesive devices. 5. Example sentences with cohesive devices. These are often called by different names such as : Linkers, Discourse markers, Transitional words, Signposting Language or Connectors. These are words like “However” “For example” “To Conclude” “Also” “In addition” “Therefore” “Similarly” and so on. However, they need to be used correctly and effectively and many IELTS students have trouble with their use. Here are 2 examples from an essay about environmental issues. 1. The government should tackle the issue of river pollution, in addition, the problem of factory emissions has to be resolved. 2. The government should tackle the issue of river pollution, however, the problem of factory emissions has to be resolved. In the second example, the meaning is slightly different because there is a linker which shows contrast. The second part of the sentence puts emphasis on the issue of factory emissions and they need to be tackled or resolved first. 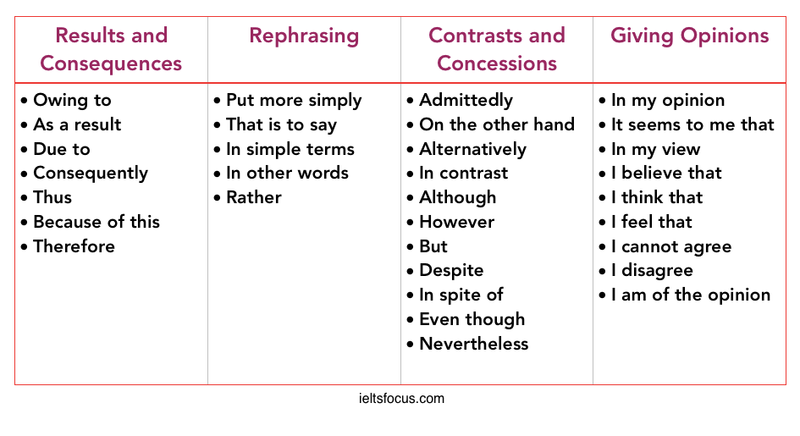 This demonstrates that you shouldn’t just memorise them, you need to practice using them in your essays and get feedback on coherence and cohesion. How are they marked in the Exam? Click here for the PDF to the marking criteria from the British Council. The problem is that some students over use them, or they do not use them correctly. They often put cohesive devices in every sentence or every 2 sentences thinking that this will impress the examiner. In fact this technique is going to cause real problems with your essay, and most likely this will lead to a band 5 in coherence and cohesion. 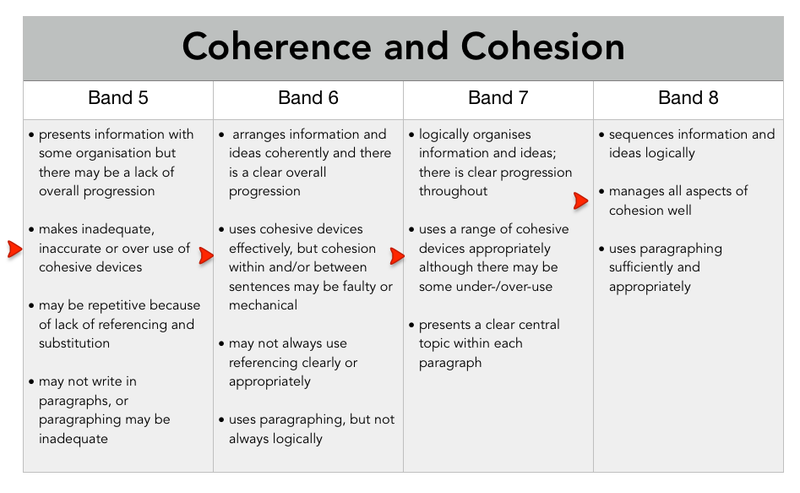 Band 7 or 8 essays show that cohesive devices are used well and effectively. Interestingly, if you look at most Band 8 or 9 essays, there are not that many cohesive devices, when they are used they are very effective. It is not necessary to have them all over the essay, just one or two per paragraph is fine. Cohesive devices are also very important to use in Writing task 1 especially when describing a process and sequencing. Here is a list of linkers and cohesive devices, but I don’t recommend memorising them, you should practice using them in your writing first. Remember that you only need 2 per paragraph so do not over use these. Can you spot the faulty cohesion in the example below? Despite of the dangers of eating too much junk food, people are still consuming these types of food and risking their health. In addition, there is a growing number of people turning to healthy eating these days, so that many more are becoming vegetarian. On the other hand, junk food is tasty so many people are eating it. In the above example the candidate has made a mistake with ‘Despite of’, it doesn’t need ‘of’ after Despite. Also ‘in addition’ is wrongly used, this is faulty use. It would be better to say ‘However’ ,also the word ‘so that’ just doesn’t seem to fit well here. Cohesive devices are faulty and overused in this paragraph. ‘Mechanical use’ means that they are unnatural or seem to be memorised. This is why you should not memorise sentences and just plug them into your writing. For example: ‘As outlined in the above essay I agree with the view put forward’ This sentence looks odd and seems memorised.. Example sentences with good cohesive devices. Key Point: Remember not to overuse these as the essay will end up sounding unnatural if the reader reads it aloud. Here is a paragraph from an essay about internet shopping. Notice how I have used cohesive devices sparingly. In the paragraph above there are only 2 cohesive devices to help with cohesion. This is a natural way to use them. Leave a comment in the box below if you have any questions.